Birmingham born and raised female MC, singer and producer aka Melesha O Garro. Leshurr's material blends her unique sound with popular genres encompassing house, hip hop, dancehall and pop. 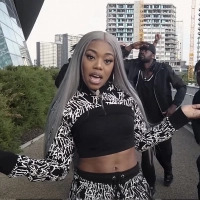 With comparisons ranging from 'a female Busta Rhymes' through to 'the UK's answer to Nicki Minaj', Leshurr has featured on tracks with Tinie Tempah, Wiley, Lethal B and Dot Rotten, to name a few." Releases include the EPs: "Every Little Counts", "Off the Lesh", "Queen of the Scene" and 2016's: "Queen's Speech".